Jackets with LEDs aren't particularly new, but Nemen's experimental project isn't just about the LEDs... it's about how it uses them. 12 LEDs are built into the jacket, powered by two rechargable batteries, which give you about 8 hours of light before they need a boost. 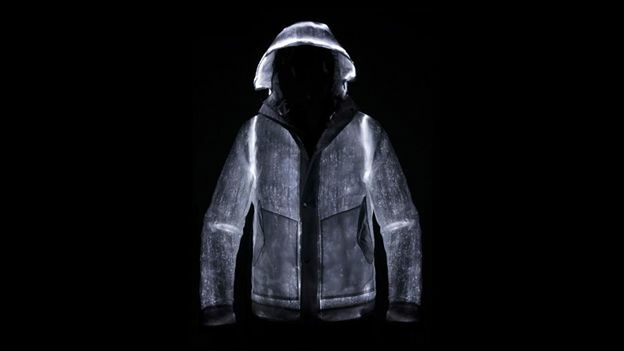 Here's the cool bit: Nemen has actually woven optical fibres into the fabric of the jacket, reflecting the light from the LEDs across the surface of the jacket. The jacket outer is a monofilament of nylon and steel with a polurethane film, which protects the delicate optical fibres as well as creating that shimmering effect across the jacket. The idea - apart from the fact that it looks awesome - is to make you visible even in dark conditions, whether that is to avoid being hit by cars, or easily found if you get lost in the mountains. Meanwhile the inner is essentially an aluminium film - like a survival blanket - that reflects your own body heat to keep you insulated and warm. And even though the jacket started as an experimental concept, you'll be glad to know it is now available to buy. But as you can imagine, it's rather complex to make, so much so that each jacket is made bespoke to order. So it'll set you back about £1,885. Head over to the Nemen website if you're interested! Here's a video of the jacket to a generic dance chill-out soundtrack.